Half-British, Half Filipina Rachel Peters was crowned as the new Miss Universe Philippines during the conclusion of the Bb. Pilipinas 2017 pageant. Rachel, who grew up in Camarines Sur Province, Bicol Region, succeeded Maxine Medina who was a Top 6 finisher at Miss Universe 2016. A total of 40 candidates participated in this years Bb. Pilipinas pageant which is considered as the most prestigious beauty contest in the Philippines. Rachel Peters is no stranger in the world of pageantry. She tried her luck at Miss World Philippines 2014 where she placed as 4th princess. A top favorite in this year’s Bb. Pilipinas pageant, she was always ranked high at Missosology’s hot picks. In the final hot picks, she was predicted to win the Bb. Pilipinas Supranational crown. 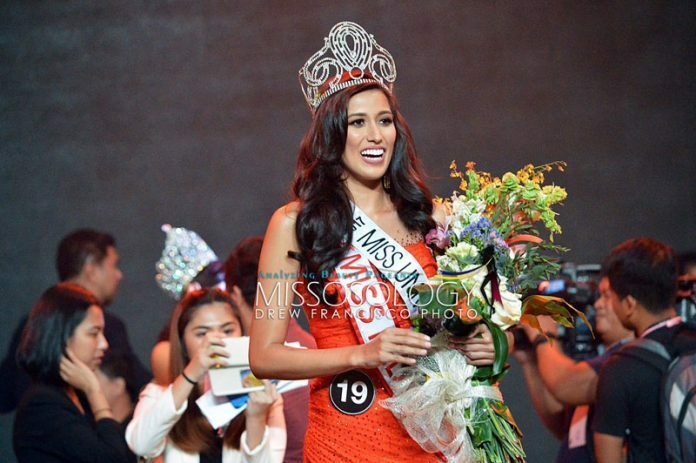 Despite being an obvious frontrunner, Rachel Peters couldn’t hide her emotion as the crown was placed in her head. She wowed the judges not only for her catwalk skills or with her shapely body figure but also with her intelligence which was apparent during the question and answer segment. Asked on what message she will give to the leaders attending the ASEAN summit, Rachel confidently answered that the growing divisiveness in the Philippines is a big concern. “I believe that one of the biggest problems of our country is divisiveness: in politics, religion, and culture. I believe it is same across the world and that is something I would like to address. If we can learn to tolerate each other’s differences and respect each other, then we will be a stronger nation going forward,” she answered which was then followed by a thunderous applause from the audience. Rachel Peters will soon represent the Philippines at the 66th Miss Universe pageant, the venue and date of which is yet to be announced. She will have an enormous task considering that the Philippines has always made it to the semis at Miss Universe since 2010. Miss Universe pageant is growing in popularity in the Philippines especially that in 2015, Pia Wurtzbach won the 3rd Miss Universe title for the Southeast Asian nation.